Outdoor projectors and outdoor theater systems are cropping up more and more across the nation. There are a couple of reasons for this; firstly, our habits are slowly taking us from our living rooms which have been the de facto place where we consider most of our entertainment needs should be met, and out into the great outdoors. Secondly, with production and manufacturing costs tumbling, what was once considered accessible to only the very richest in society is now freely available to all at incredibly affordable prices. 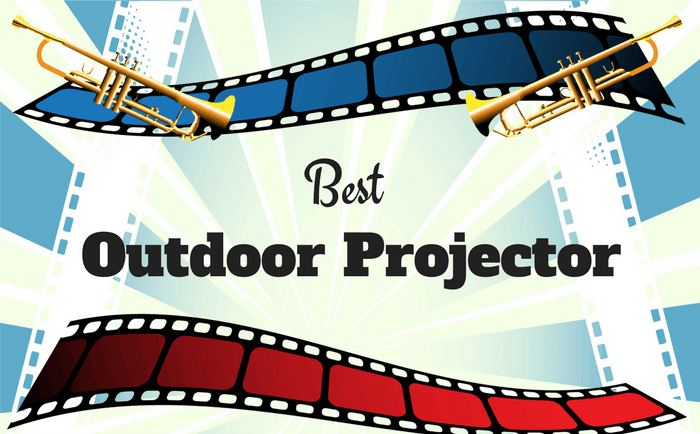 So we’ve decided to write a review on the best outdoor projectors currently available. The HD142X by Optoma is pound for pound the best outdoor projector on the market. For its price you get 3000 lumens and a Full HD resolution. This is more than enough for your outdoor needs. Equally comfortable displaying sports, movies or games, the HD142X offers sRGB color profile ensures a rich display which is enhanced by the deep black output it can achieve. The PJD5155 by ViewSonic is a very good outdoor projector which whilst not having the upper limits of screen resolution still throws out 3300 lumens. The fact that it comes in at under $300 is the massive plus point for this projector however. The resolution might not be that of some other projectors but the picture is still clear and crisp on a projector screen and if you are just interested in enjoying some entertainment with friends you can’t go too far wrong with this. The DLP Video Projector by BenQ is similar to the ViewSonic above in that it offers 3300 lumens and outputs an SVGA resolution. It is slightly cheaper than the ViewSonic though perhaps the sharpness of color isn’t as apparent. Still, if you are counting how much you have to spend and savings must be made then this is a very worthy alternative. It has an added benefit of being 3D ready, if any of you are still into that kind of thing. The Full HD Video Projector by CAIWEI boasts some pretty impressive specs. It offers 3600 lumens and a full HD picture resolution. It also has a great price, being under $400. It Claims to have a lamp life of 50,000 hours but I can neither confirm or deny this, although very impressive if correct. All the connectivity you could need is available from HDMI, vga, Dual USB etc, etc. What tarnishes this projector slightly is the lack of a clear manual which can prove frustrating if there’s something that you don’t quite understand. The GM60 Multimedia by Ezapor is the budget option out of this whole list. The specs are nothing to shout about – it has 800 lumens which means you will have to wait for nightfall. What it does have though is a very good picture that is more than good enough to watch with friends or family. As long as you’re not expecting 4k, pixel perfect quality then you won’t be disappointed. 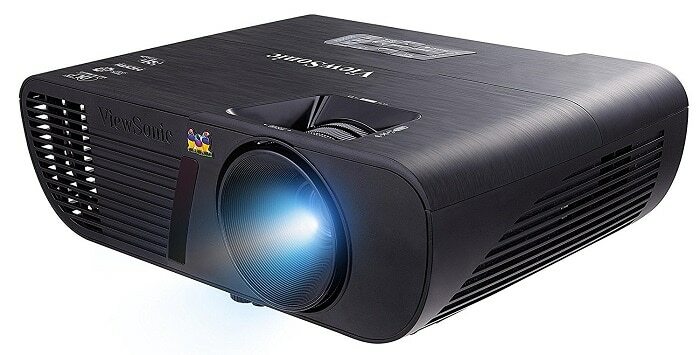 For under $100 I guess you get what you pay for but if your intention is just to do something different at a very affordable price then this projector will cost you less than an average night at the club. Rushing head first into anything in life is never that advisable unless it involves Tequila. I have yet to hear one bad story involving that Mexican nectar from the Gods, so rush away! For everything else though, a bit of research and understanding is required before making decisions, especially financial ones. It’s the same when buying an outdoor projector, there are things you must take into consideration before purchasing one. For instance, what is the intended use of your purchase? Do you intend to use it as an outdoor movie projector or something to watch the big game on? If the answer is yes, you might want a projector that can deliver a brighter, crisper picture as opposed to someone who just wants to distract kids with cartoons. How much space is available may also influence which outdoor projector is best for you. If your outdoor space is big enough then there shouldn’t be too many problems but if space is at a premium then you will have to consider buying a short throw projector which is especially designed for such situations. Below are some of the main technical features I would look for when choosing an outdoor projector. So as not to put you off with too much tech talk we can think of lumens as being a projector’s brightness. 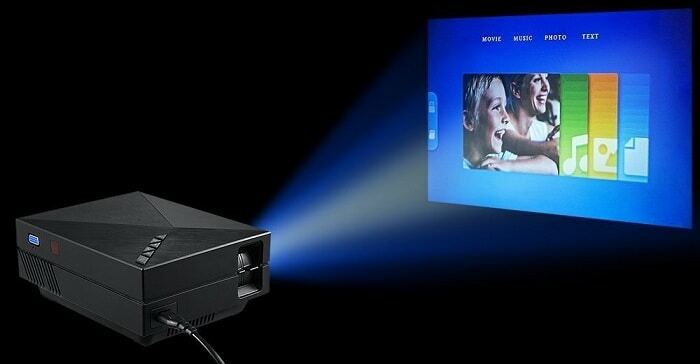 The amount of lumens the projector possesses is a good indicator of how bright you can expect your picture to be and therefore when you will be able to play your media. You can typically expect modern day outdoor projectors to have lumens ratings of between 800 and 6000. If you were to start playing your movie or TV show at around dusk, you would generally require your projector to have at least 2000 lumens. Anything brighter and you can play in lighter and lighter conditions, anything less you will have to wait until it is dark. As with everything, there are variables which can increase or decrease the number of lumens needed. For example, if you were projecting onto a 100-inch screen you will need fewer lumens than if you were to project onto a 300-inch screen. We’re led to believe that bigger is better and it is most certainly true for most things, but does this phrase hold true when considering a projector’s resolution? The rather frustrating answer I’m afraid is – it depends. Yes, higher resolutions will allow more pixels to be shown on your outdoor projector screen and therefore give a clearer, sharper image. Is it necessary? To some people it will be absolutely necessary, to others, not so much. It depends on your personal preferences and what you expect from your outdoor projector. Personally, I find a projector with a 720p output adequate although I do appreciate greatly a picture that can be viewed in 1080pHD or 4k. You just have to bear in mind your budget and what you are comfortable viewing. Long gone are the days where you had to run meters and meters of cable from your TV or laptop to the back of your projector. We live in an age now where the amount of different ways that we are able to connect is simply dazzling. Sure, we can still use a port to port system like HDMI cables and this is still the most popular way to connect but there are also wifi, USB, Bluetooth among a few of the options available to us now. The most exciting use for outdoor projectors nowadays in my opinion is the ability to stream content straight from your cell or tablet. With the aid of the new generation of streaming tools such as Roku sticks, Chromecasts and Amazon Firesticks, we are truly stepping up the game. So for me, connectivity is a big issue when choosing an outdoor projector. I might like the looks of a certain model but if all that is being offered is basic connection solutions then I will be more inclined to look elsewhere. As with everything on this page though, it’s what best suits your needs and budget. This isn’t so much a guide to setting up individual outdoor projectors, more a few things I consider essentials to ensure that you get the most out of your viewing experience. A bit of preparation will save you possibly hours of your precious time further down the line so it is well worth your while to make sure everything is taken into account at the setting up stage. Water – Unsurprisingly, considering there are electrics involved, you should look to use your outdoor projector in dry conditions. This means keeping it away from any source of moisture that may be present such as a nearby swimming pool or hot tub if you are lucky enough to own one. Sprinklers, hoses and other water features such as fountains are also recommended to be turned off. Light – For the optimum viewing conditions of your outdoor projector then you will need it to be as dark as possible. I love to do a bit of stargazing from time to time but it is not always possible due to the light pollution in my area. As well as the many street lights that emanate from around me, things like moonlight also mean I miss out on a night of looking up to the heavens. The same things can affect the quality of the picture coming from your outdoor projector. As well as the obvious light sources such as moonlight and street lights adding to light pollution, so can less obvious sources such as ambient lighting from inside your house or from things such as tiki torches. Reducing sources of light pollution will help to give you the best conditions to watch your outdoor projector but it’s certainly by no means a disaster if you are unable to do so. It is estimated that to watch a decent standard of projection in pitch black you will need 1200 lumens but we know that projectors can far exceed these numbers. To watch projections at dusk we already know we should have 2000 lumens and in light conditions we should probably have a projector with 4000 lumens. All this goes to show that even though light conditions may not be optimal, it certainly doesn’t mean that our viewing experience will be hampered. As long as you have the right setup, watching your outdoor projector in the sunlight is more than possible. Dust – Projectors will all come with filters that will need cleaning periodically. This is as easy as taking it out and cleaning with a soft brush but if it is left in a particularly dusty location for any amount of time then the filters will need cleaning almost after every use to stave off build-up of deposits that can lead to overheating of the projector which can cause it to shut down. Because projectors are susceptible to overheating, it is also recommended that you place it somewhere which has good airflow. Tucking it away in a corner somewhere is therefore not an option. Knowing your throw ratio and subsequently the distance between your projector and your outdoor projector screen is imperative to ensure a good quality picture. The throw is the distance your projector needs to create a good picture when taking in variables such as screen height and width. As previously explained, if space is at a premium or there are natural obstructions between the projector and the screen, you will need something with a short throw ratio that can be placed at a closer distance. If you face no such hurdles then a projector with a larger throw ratio can be bought. It’s all about finding the sweet spot in the placement of your outdoor projector that will fill the space afforded to you by your screen whilst producing the best quality picture. The user manuals will almost always define your throw ratio, from there you can easily calculate how far back you need to position your projector. If in doubt there are handy tools available online such as this calculator from Chief. Making sure that your outdoor projector is stable can eliminate one of the most annoying things about using projectors – shaking. When using your projector as a home theater in your living room or at an office for presentations, it is easy to stabilize it and eliminate the shakes. A good bracket or a purpose made shelf is all that is required to be rid of the pesky things but when your portable projector is being constantly moved from storage to back yard when required, it can prove to be a bit more of a challenge. It’s not to say that the solutions aren’t easy, it’s just not as practical in achieving them in the same way as the indoor solutions. The easiest way to make sure your projector can remain as still as possible is to build a solid base on solid ground. This can be a permanent or temporary fixture although I’d suggest the latter. I normally use a speaker tripod which I attach an adapter bracket to. It’s a little unconventional but I find the width of the tripod legs when spread out offers awesome stability. Alternatively you can use every day, solid options that may be lying around your house such as wooden crates or outdoor benches. Just be sure that all safety precautions are taken and any wiring is not liable to be tripped over. Using Duct tape to ground any loose wiring is a good way to do this. One of the main reasons for the explosion in popularity of outdoor home theaters is the versatility which they provide. You can go as small or as big as you like when it comes to viewing your media. Sizes are generally around 100 inches but can reach full cinema screen sizes and well beyond. This means that whatever restrictions you may face due to space, you will certainly find an outdoor home theater setup to suit your needs. Outdoor projector screens also come with the added benefit that they can cost as much or as little as you wish to pay. Heck, you could even turn every-day items into an outdoor projector screen without having to pay a cent. The best portable outdoor projector screen is ultimately the one that fulfills all your needs, namely size and budget. Below you will find what I consider the best buys for certain price ranges. You will find that many are upgradable to larger sizes should you be able to make your money stretch that little bit further. Fixed outdoor projector screens are also available which are very good but for the purposes of this article I believe the portable variety best represents what we are looking for. 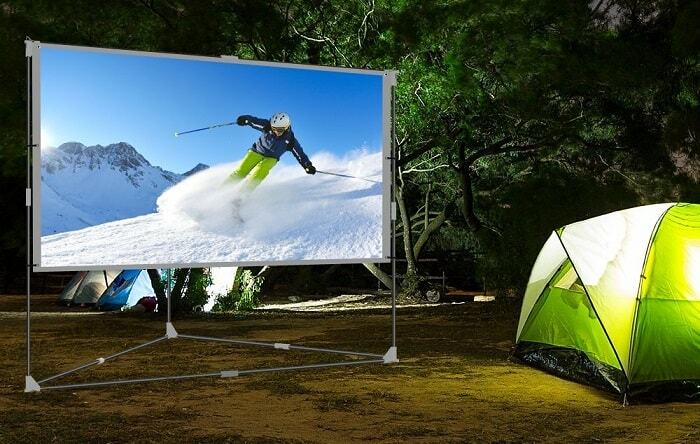 The wrinkle-free portable outdoor projection screen from JaeilPLM comes right in at our budget at $99.99. It boasts a 100-inch screen which offers a 16:9 aspect ratio and is capable of producing 4k pictures. It comes with a triangular base frame which is quite rare with these products. This design feature does allow it to provide a wide, sturdy base however. You might need to weigh it down with additional weights as it is quite light at 13 lbs but for the money it’s easy to overlook. The Yard Master 2 from Elite Screens is our favorite projector for under $200. It has a 120-inch screen with a 16:9 aspect ratio and offers a 160-degree viewing angle. The screen itself is active 3D, 4K Ultra HD and HDR ready, whilst being black backed to produce a superior image. The frame is a straight forward folding one which has been designed for ease of use and possesses locking joints which aids the screen’s snap in feature. This all provides a stable base for the unit as a whole and ensures that the screen is always taut. Carl’s fexiwhite standing projector screen from Carl’s Place is an absolute behemoth. It offers an incredible 272-inch screen surface for those occasions where you just have to invite the whole town around to yours. There are some cons which come with this screen, the main one being that the poles for the frame are not provided and you have to make them yourself. But ….. 272 inches!!! I feel giddy just looking at that measurement. The positives are that there are instructions detailing the dimensions of the poles you need, the screen does come with all the grommets and the required black ball bungees for tautness. The flexiwhite material it is made from has virtually no texture which aids in producing clear, sharp images whichever projector you decide to pair it to. Inflatable outdoor projector screens, as with many inflatable outdoor pieces of equipment are becoming more and more popular. Generally speaking, the material being used now is of a much higher quality which is preventing rips and tears that used to blight the inflatable genre. As reliability has grown so has the expansion in variety that we now see. Everything from hot tubs to buffet coolers are now made from inflatable materials and consequently, the cost of these items has plummeted making them accessible for all budgets. Inflatable outdoor projector screens are pound for pound the cheaper option when choosing between them and the fixed frame projector screens, for the same size screen you will almost certainly pay a lot less. So why doesn’t everyone have one? Well, there are a couple of things to take into consideration. Being an inflatable item doesn’t merely mean you blow it up and tie it off like you would a balloon. They need to be packed to be used again so popping them isn’t an option. Hence, there are motors or fans attached to them that need to be constantly running when erected. This can create noise which, whilst not deafening may impact on your viewing experience. Some models are louder than others but to be fair, I find the noise negligible, especially when the volume is at a decent level. You may also find that you will not get the same tautness that you can achieve with a fixed frame outdoor projector screen. As the air inside will never be a solid mass, it is liable to fluctuate in the breeze which may impact on the solidity of the picture you are trying to watch. Again, this is not a problem for me. I can take a few rough edges here and there, if I wanted pixel perfect images I’d go to the movie theater. For some people though this might be a niggling annoyance that they can’t get over. There are two inflatable outdoor projector screens I would like to point you towards and each are on the bigger end of the scale. I choose them because I think an inflatable screen is best used for getting a whole stack of your friends round and enjoying some movies. For this, I feel that bigger is definitely better. 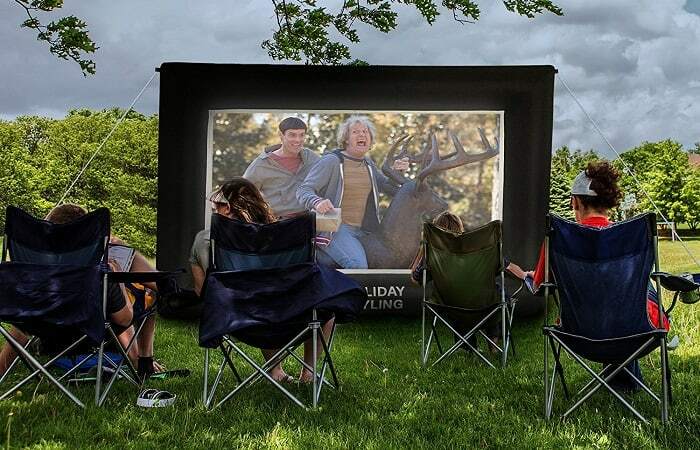 This inflatable movie screen by Holiday Styling is an awesome option if you were looking at getting into inflatables. The screen comes in at around 150 inches and sets up in roughly 2 minutes. That’s 2 minutes of doing nothing much as opposed to trying to fix poles together for the fixed screen varieties. It has a detachable white screen that can be cleaned separately if necessary and offers front and back projection capabilities. It comes with ropes and pegs that are used to make the screen as taut as possible whilst also featuring a triangle frame design for extra sturdiness. The IWS200 by Loch is the screen you need if you want to do a bit of showing off. It has a massive 200-inch viewing area which inflates in less than a minute. It can also be used with front and rear projection and comes with the stakes and tethers required to make it as sturdy as possible. It also comes with a carry bag meaning that if you want to take it camping with you and want to entice some friendly strangers in with a good movie then it is not a problem. Possibly the best thing about investing in an outdoor projector is you can throw your image onto almost any flat vertical surface and get all the benefits without actually owning a screen. Sure, the picture clarity is going to be infinitely better with a purpose made screen but it’s not to say that you can’t have equal amounts of fun without one. Bed sheets are probably the number one item you will find a DIY outdoor projector screen will be made from but house walls, garage doors, sides of trucks or RVs and many, many more items can, and have been used. So is there anything you should know before throwing your projector onto your every-day items? Well, firstly you need as light a surface as possible. Almost certainly white but you can get away with light grays. The surface should also be as flat as possible, thus not allowing the picture to become distorted. If using sheets then make sure they can be tied off to suitable, sturdy anchor points. Trees, gutters, car doors can all make good points to tie your sheets off to, just make sure that they are nice and taut. Outdoor projectors for your themed outdoor movie nights or for getting the guys round to watch the game are definitely enjoying a bit of a boom. We can see that although prices are dropping at a rapid rate of knots you can still spend a small fortune on your setup if so desired. For me this is unnecessary, these nights are meant to be about fun, not critique. I find that many projectors under the $300 mark give me the exact same amount of pleasure when I’m surrounded by friends and family as one that costs thousands of bucks. The latter might be all singing and all dancing but at the end of the day, like many of you reading this, I just want to sit back and enjoy a good movie with those that I choose to share my time with. Lumens are the number one spec that everyone looks to and rightly so as this can determine where and when you will get to enjoy your projector but connectivity is a massive factor for me nowadays, especially with so many streaming options now available to us. Thankfully, most modern projectors offer HDMI slots for us to plug our sticks or boxes into and enjoy services such as Netflix and Hulu. What I’m ultimately trying to express is that you don’t need to spend a fortune to enjoy a backyard movie night, the cheaper options nowadays offer more than enough technology for it to become a past time that everyone can enjoy.